Concert goers and sports fans have thronged this arena since its opening in December 1989. Many sports stars, rockstars and world-famous bands have captivated audiences with performances at the Singapore Indoor Stadium in Kallang. Designed by legendary Japanese architect, Kenzo Tange, this indoor spectacle has a cone shaped roof and pillarless arena. Besides giving local and visitors their entertainment fix, it is also the home ground of the Singapore Slingers, the nation’s finest basketball warriors who battle it out in the Asean Basketball League. In 2010, it will also host the intense action from the world’s most talented young badminton and table tennis players in the inaugural Youth Olympic Games. 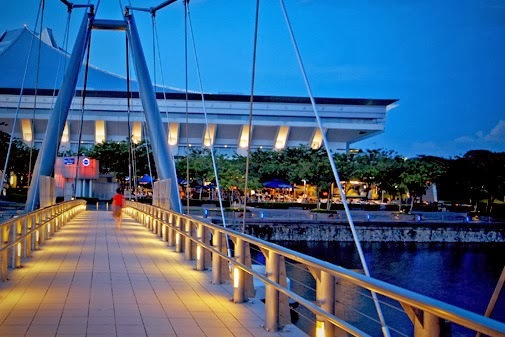 Stadium Waterfront located behind the stadium has retail outlets and restaurants serving an eclectic range of cuisine such as local Chinese seafood, contemporary Indian and Italian. These establishments offer alfresco dining with a scenic backdrop of the beautiful coastline. Look out for occasional street markets too.